Leaders of the Michigan Hispanic Alliance hope to expand their influence and strengthen partnership opportunities. LANSING, MI -- It's a hot Friday night, and a group of teenagers is hard at work on dance steps for the upcoming cotillion celebrating the 18th birthday of Monica Lopez. 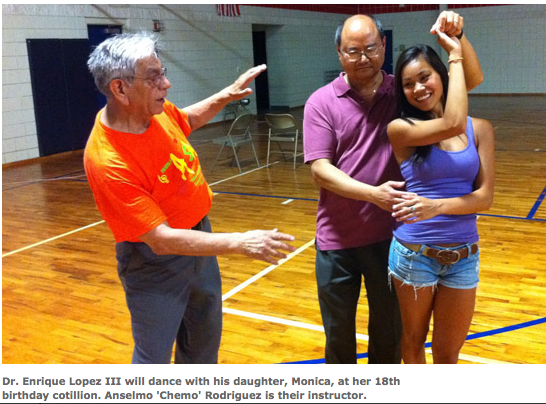 Their instructor is Anselmo Rodriguez, who goes by the nickname Chemo. Rodriguez is a member of the Lansing Area Hispanic Business Association (LAHBA). His Dance for Wellness business is coupled with work distributing a health drink. He's an energetic man of 74, who says dance has kept him so fit that he can still do the splits and run a sub-five-minute mile. Rodriguez brings that energy to his membership in LAHBA. "As a former vice president of LAHBA," Rodriguez says, "it was our intent to make sure that we help those people who are going to the university, to get them acclimated to the business world, so that by the time they graduated, they hopefully would have their own business, or maybe hired into a profession." LAHBA was founded in 1999 to help Hispanics network and develop their business skills. The group's president is John Joseph Castillo. After a 30-year career as an executive in the Michigan Department of Civil Rights, Castillo started a consulting business ten years ago. As president of the association, he's fully behind LAHBA's new alliance with the Michigan Hispanic Chamber of Commerce, serving metro Detroit, and similar groups in west Michigan and the bay area. He sees a win-win situation for all of them. Together, he thinks they could soon help members save on insurance. "Some of the other associations have already partnered with large insurance companies," Castillo says. "So, therefore, the members there can get discounts. We in Lansing have not established that route yet, but that becomes a strong possibility. We would be able to tap in on their resources, and offer it to our members." Castillo is hoping that the alliance can expand beyond Lansing, Detroit, west Michigan and the Great Lakes Bay Region to include other parts of the state. Early childhood development specialist Marissa Zamudio joined the Lansing association this year. She says helping kids get off to a good start needs to be a component of LAHBA's agenda, and she thinks expanding the group's reach beyond Lansing will produce a unified message. "My goal is to provide them with information about early childhood development," Zamudio says, "and its link to workforce development, economic development, and of course, how that impacts on business, and their ability to stay competitive." Getting Hispanic kids going early could become an important component of producing young adults who are prepared to enter the business world. Back in that hot gym, dance instructor Chemo Rodriguez is wrapping up his lesson. Joining forces with other Hispanic business groups in Michigan, he thinks, is a dance step in the right direction. "The whole state is in turmoil when it comes to jobs. The markets out there will move when they know people are cohesive, together."